Neal Glaser had met Ringo Starr a couple of times. As an art distributor and publisher outside Philadelphia, he’d rubbed shoulders with a few celebrities. He’d handled Jimi Hendrix’s estate and met his sister. He met Paul McCartney’s brother-in-law. A Beatles fan and art collector-turned distributor brings signed prints from John, Paul, George and Ringo to Danielle Peleg Gallery — plus, Paul McCartney comes to Detroit. 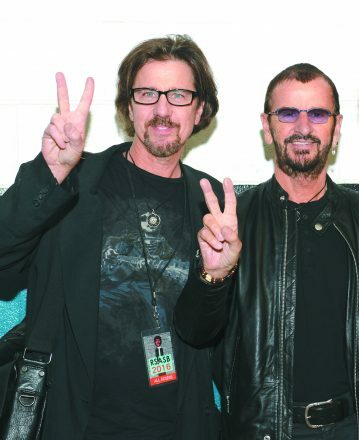 So it was a huge deal for the lifelong Beatles fan to meet Ringo, but not entirely out of the realm of possibility. Glaser knew that Starr was an artist, so he asked the former Beatle if he was interested in putting something together with his art. Starr said no. They met again, and Glaser asked again. Starr said no. “You don’t expect Ringo Starr to call you at home,” Glaser says. Glaser says absolutely. Starr tells him his assistant will give him details on how to get to his home in L.A.
As an adult in his 20s, Glaser got into the gas-station business and moved from his native New York to Litchfield, Conn. But he had always been passionate about both art and music — especially the Beatles, since he first saw them on Ed Sullivan when he was 10 years old. In Connecticut, he began collecting — which led to meeting other serious collectors. 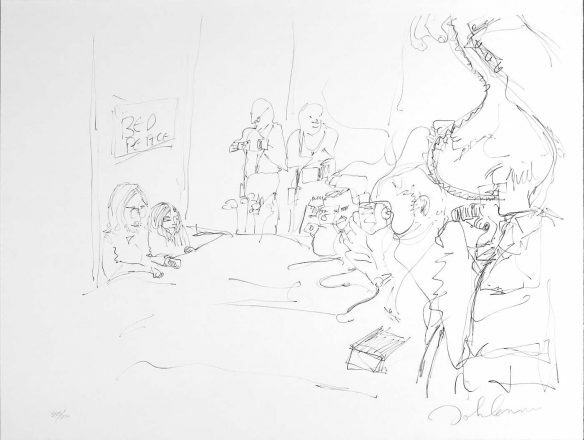 He also met caricaturist Al Hirschfeld — whose work appeared in books, theater, record covers, postage stamps and every major publication of the time — including a 75-year relationship with the New York Times. 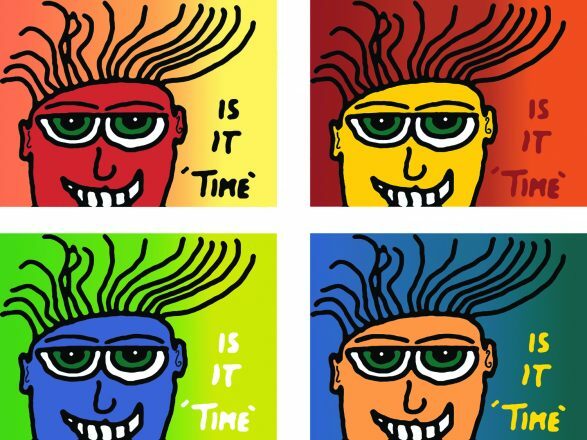 After meeting Hirschfeld, Glaser turned what started as his own personal collection into ArtCelebs (artcelebs.com), which presents and publishes works by celebrities not usually known as fine artists, including David Bowie, Frank Sinatra, Jerry Garcia, James Dean — and each of the four members of the Beatles. 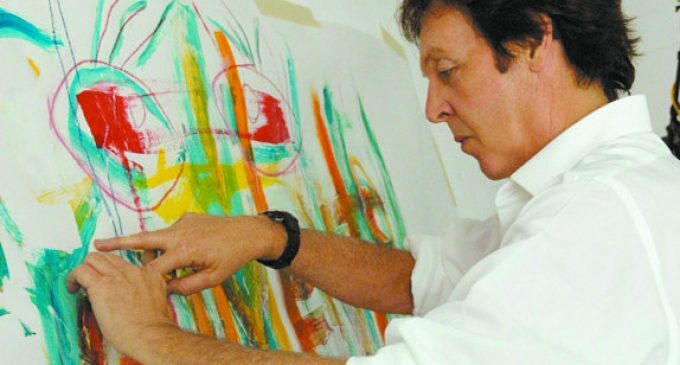 Among them, of course, is Paul McCartney, whose upcoming appearance at Little Caesars Arena Oct. 1-2 spurred the timing of “The Beatles Art Show & Sale” at the Danielle Peleg Gallery in West Bloomfield Sept. 30-Oct. 3. 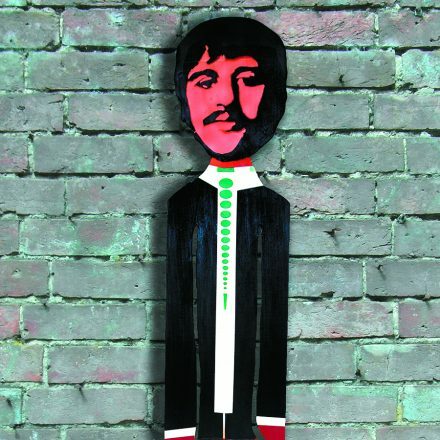 The exhibit features hand-signed artwork from John, Paul, George and Ringo. 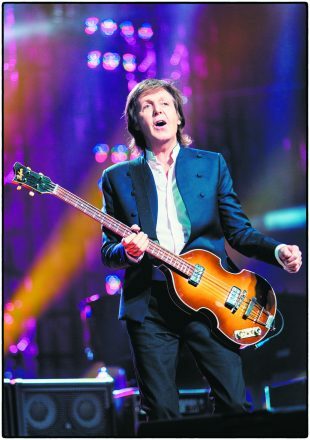 “I worked with Paul once — he’s only released eight pieces since 1999,” says Glaser, who is McCartney’s exclusive distributor. “He really is all about the art and doesn’t advertise that he does it. He’s not like that. So for people to be able to see these pieces is a pretty big deal. “His father-in-law [Linda Eastman’s father] and his family were entertainment attorneys, and he represented Willem de Kooning and other artists. They are really the reason Paul went into publishing and buying songs — he was a huge influence on Paul,” Glaser says. 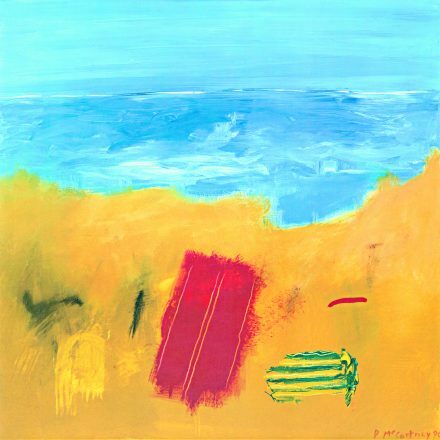 McCartney’s own work, says Glaser, which he started painting in the 1980s, tends toward the Abstract Expressionist and is heavily influenced by de Kooning. “John Lennon had a love affair with the visual arts,” Glaser says. “He was a line drawer, like Thurber or Hirschfeld. We have what’s called the Bag One Portfolio. It was a gift to Yoko for their wedding — he personally supervised the printing, publishing and signing. Glaser is also impressed that 100 percent of proceeds for Starr’s art is given to the Lotus Foundation, an organization founded by Starr and his wife, Barbara, to fund and support projects aimed at advancing social welfare. 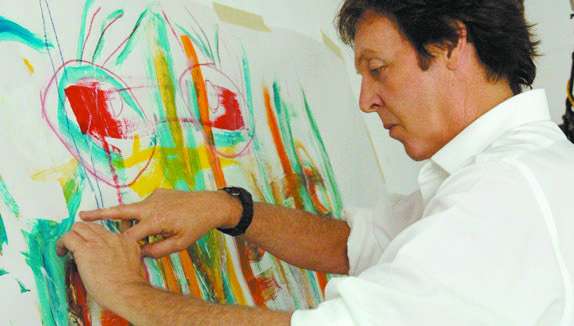 “I’ve worked with a lot of other artists, but the Beatles are my focus,” Glaser says. “I’ve been touring with Ringo for 16 years — we talk to people, we sell a couple of pieces of art and we raise money for charity. He’s been so amazing to me. “People wonder, are they good guys, Ringo and Paul?” Glaser says. “They’re so real and down to earth. Everyone wants a piece of them, but they’re just these guys from Liverpool. “I’ve been a fan for so long, that this is just surreal to me,” he adds. “Life is funny. I’ve been lucky. And I love to share it with other fans. “Beatles fans and art lovers will love to see this exhibit,” Glaser says. “People don’t have to buy. This is for the love of Beatles and the love of art. I love when people come in and gasp. 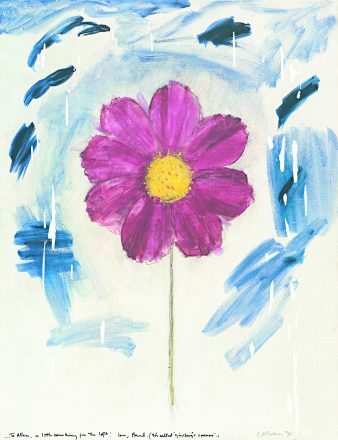 McCartney painted Ginsburg’s Flower for Beat poet Allan Ginsburg. 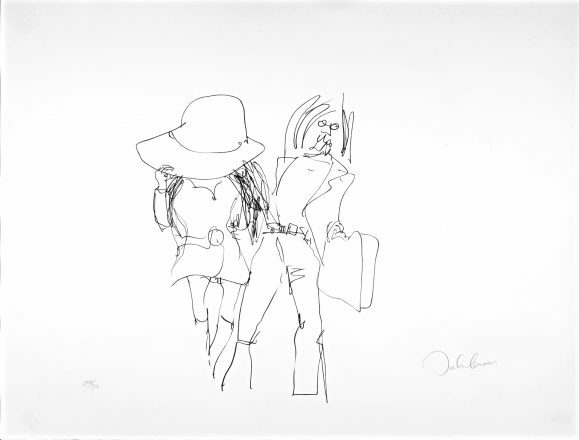 Honeymoon is part of John Lennon’s Bag One Portfolio, a wedding gift to Yoko Ono. Paul McCartney brings his One on One tour to Little Caesars Arena Oct. 1-2, performing three hours’ worth of some of the greatest music from the last 50 years. $59.50-$250. (800) 745-3000; olympiaentertainment.com.